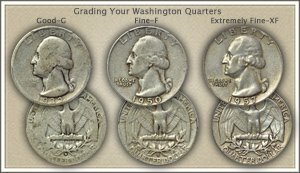 How to grade old quarters yourself. Proceed through the grading process using videos demonstrating standards used in grading. Images pinpoint the areas on the quarter to inspect. Descriptions detail the subtle parts of the design needed to lock in a grade. Highlighted above is the reverse of a silver Washington quarter. Future values of these; now old quarters, have potential. Today, collector interest is largely focused on the mint state grade; coins in uncirculated condition. However, extremely fine examples - lightly worn coins are affordably and would present an interesting collection of the early silver issues. The bold high relief of the design also sets it apart from the modern version of the Washington quarter. Inspect your coins and set aside those with ample detail as seen in the close-up. Future collector premium is possible. 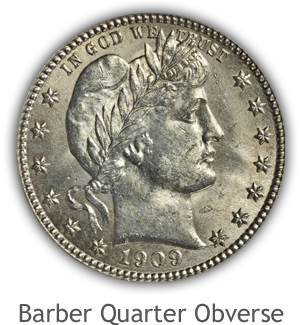 Barber Quarters: A very worn Barber quarter is valued closely to its silver content. True, there are valuable key dates and mint marked issues in this grade, however these are rare. Added value of your coin is best found by accurate grading. 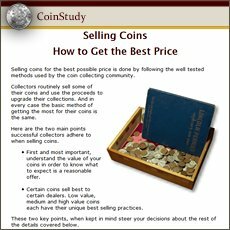 Judging your coin is a higher collector quality leads to greater worth. Judge and grade your quarter by Video | Images | Descriptions. Condition separates the common bullion silver coins from the above average collector coins. 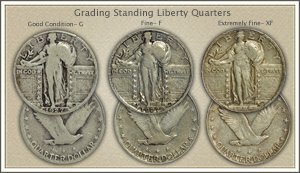 Standing Liberty Quarters: An interesting series of quarters to grade. Awareness of subtle points plus close examination finds the true grade. Separating a fine grade coin from a better extremely fine example is added value. Standards for grades are examined with Video, Images and descriptions. Grading quarters judges the surface of the coin, details of the design are examined and a grade is determined. Washington Quarters: Close examination of the surface of a Washington quarter is needed to separate worn coins from Mint State coins. Quarters with no wear to the surface are the grade with the largest value premium. In the grading process the hair of Washington is examined closely to confirm the mint state grade. Value potential is also found in many lightly worn examples. Key features to grading quarters are detailed in the Video | Images and descriptions examining each grade. A study of mint state quarters reveals the intricacies of design. Fine and small details wear quickly in circulation. High profile areas also begin to wear just after entering circulation. Knowing the complete design aids in understanding how to grade a worn coin. What is missing due to wear and by how much follows a pattern unique to each denomination of quarter. Imaged are mint state grade (non-worn) examples. The important areas to inspect are described and become important metrics used in the grading process. Liberty wearing a cap fills the obverse of a Barber quarter. A laurel wreath is overlaid on the cap. Individual leaves of the wreath are detailed with many showing raised and lowered contours and central veins. Liberty's hair above her forehead extends down to the ear. Many waves give dimension to the hair as well as fine lines within the design. Her hair is one of the highest points of the obverse design, prone to wear and is the first to inspect. Included as a distinct feature of the obverse is the ribbon at the front of the cap with "Liberty" inscribed. Strong separation of the upper and lower edges of the ribbon is a notable feature to the uncirculated grade. Highly detailed is the reverse of a Barber quarter. Many opportunities are presented to aid in grading these old quarters because of the intricate design. An eagle with a center shield is first to examine. Vertical and horizontal lines are within the shield and are prone to early wear. Feathers of the eagle are represented by rows and each feather is separated and convex in profile. Tail feathers are the most complex showing very fine lines within each. The center tail feather is defined with a center line and many small details. 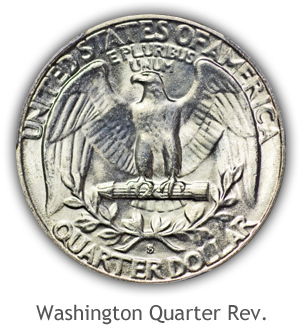 Obverse of a Standing Liberty quarter proved difficult to strike fully by the mint at the time. Often the head of Liberty and the shield close to her body are weak in definition in original mint state grade. Confusion as to how to grade these coins is eliminated by taking into account weakness of design in these areas. Liberty herself is well contoured with many high and low areas to the design. Fully rounded outstretched arm is holding an olive branch. A ribbon crossing her body through the midsection is bold. Both the top and bottom edges of the ribbon are distinct. Liberty's gown features folds fully separated and well contoured. An eagle in flight is majestic on the reverse. Feathers are easily recognizable on the wings and breast of a mint state graded coin. Leading edges of both wings are high in profile and rounded giving depth to the design and a bold separation of the field. Small details, such as fine lines separate tail feathers and talons are easily seen. Also note the centers of the stars are raised above the ends of the points. High dimension in the star centers is a subtle element to grading. Very high in profile is Washington's portrait on the obverse. Highest still is the hair and area surrounding the ear. Waves are found within the hair and a high area is at the back of the head. A distinct contour defines the separation of Washington's cheek below the eye from the cheek above the jaw. Washington's neck is also well rounded. An eagle with outstretched wings on the reverse provides an opportunity for fine details. Rows of feathers are found in layers and each feather is well separated. Talons of the eagle are in a high area of the design and show boldly with rounded dimension. Fine in detail is the bundle of arrows within the eagles grasp. Each arrow is separated and small details are found within the arrow heads. Grading a Washington quarter also judges the center of the eagle for loss of fine feather detail. There is a tug in the value scale of old quarters. Bullion silver value is high for these coins forming a strong underlying price. Appeal to collectors for a coin is now a grade consideration. Higher grade examples of dates and mints are now in demand due to scarcity. It is with accurate grading of these quarters finding full collector value is possible. 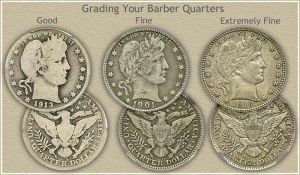 Series such as the Barber quarter have a break point, the Fine grade, that clearly separates bullion silver coins from higher collector coins. 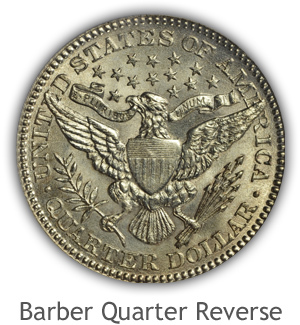 Worn Barber quarters are worth $4.60 to $5.30 each. Grading accurately and determining your coin is the Fine grade discovers a collector quality coin. Examine closely the ribbon in Liberty's hair, a full seven letter "Liberty" is one key standard to the grade of fine. 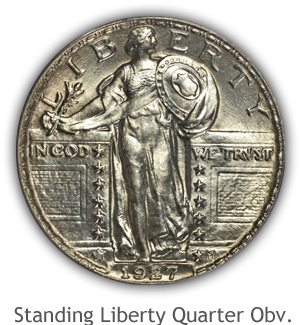 Today 4/15/2019 silver alone raises the value of any Standing Liberty quarter to $3.42 each. A well-worn quarter dated 1925 - 1930 falls into this value range. 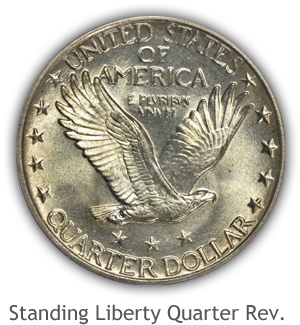 Early Standing quarters are worth well above minimum silver value. A readable date 1916-1924 is needed to enter the collector value range. Grading these quarters involves many subtle points to judge. Design changes during the minting of the series adds complexity to grading. Time spent accurately judging condition is important. Special attention to the mint state grade finds collector quality coins. Silver today 4/15/2019 is $14.90 per ounce. 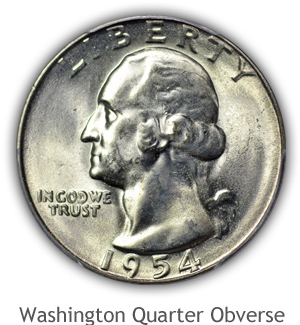 The majority of worn silver Washington quarters are directly tied to this price. First step to value in the Silver Washington quarter series is date hunting. 1932 through 1940 are the important dates. It is within these years many worn examples in the Extremely Fine grade have collector appeal. In highest demand are Mint State grade quarters, those without any wear to the surface. Recognizing full mint luster on all high areas of the design is key to judging uncirculated coins. Washington's cheek and hair are highest in profile and first to judge. Begin grading quarters yourself. Videos visualize the process. 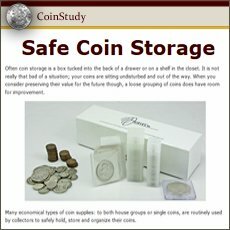 Compare your coins to reference images of the different grades. Descriptions highlight key areas to judge for each series. Combine video, images and descriptions to grade quarters. Return to the index page of grading old coin videos. Standards for grading coins presented with video, images and descriptions. Of the top three factors to value: Date | Mint Mark | Grading. Grade your quarters conservatively, note the date and mint mark and find values listed on the chart. US coin value charts. Coin series and values from cents to gold coins are found by following the images and text links. Identify your coin and go to value charts listing dates and mintmarks by grade.